We live, work, and learn in buildings. Why and how were buildings first constructed? How did they get larger? Sturdier? Grander? From the Great Pyramids to the Pompidou Center, people have sought to create structures not simply for shelter, but as symbols of wealth, power, devotion, and ingenuity. 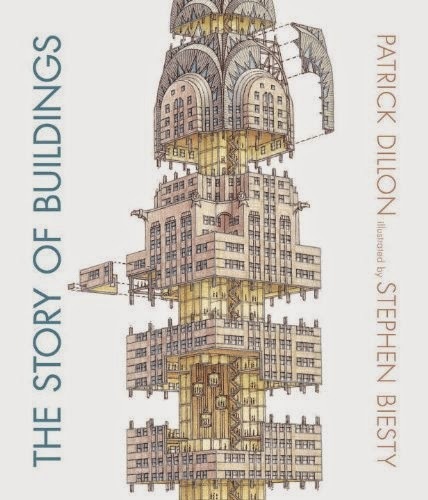 Dillon weaves the stories of buildings—and the genius people behind them—in this comprehensive look at architecture. A seriously fantastic factual book for kids. On one hand, I think the (extremely!) detailed illustrations, fold out pages, informational tidbits, and timeline layout were really amazing. Plus, I already seriously enjoy architecture, so I think it's awesome. On the other hand—in a critical, adult sort of way—I wonder why they chose to focus on the buildings they did. And why they put in such a blatant, random plug at the end for energy efficient building. Overall, the first hand wins and I think this is a fantastic book.